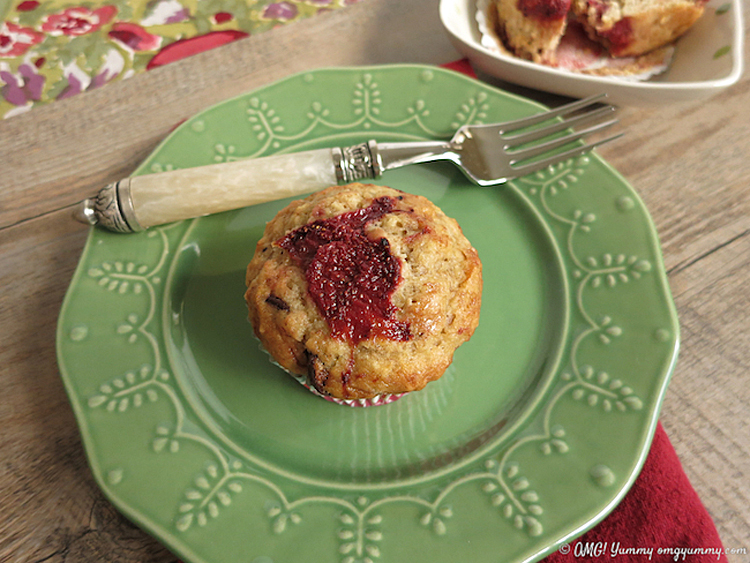 Banana Chocolate Chip Muffins with Roasted Strawberries from OMG Yummy! Today’s recipe, Banana Chocolate Chip Muffins with Roasted Strawberries is the creation of Beth Lee, one heck of a great lady that I am lucky to call my friend! Beth and I have been online friends for years, and though we are both in the Bay Area, have had very few opportunities to spend time together. A few months ago, at IFBC in Sacramento we finally had the chance and I thoroughly enjoyed every minute! Beth and I were both very strongly influenced by our grandmothers, sharing many similar memories of spending hours with them in the kitchen. We both grew up enjoying walking into the house with the smells of an amazing dinner or treat being made, our mouths watering in anticipation. We both have a passion to share our experiences with the next generation of cooks and bakers, and documenting our beloved recipes for our own families. We also both came from the High Tech industry in Silicon Valley and are happy to be out of that rat race! It is funny how many delightful food writers live in the Bay Area and yet we rarely see each other except at food conferences. It always amuses me but with a touch of sadness. I wish we could live in the same neighborhoods and be close enough to drop by for a cup of coffee and a slice of cake or pie whenever we want. But the nature of where we live can put us hours apart thanks to the heavy traffic on our local highways. Beth loves to bake for her family and one of their favorites is her Banana Chocolate Chip Loaf. Today’s recipe is a riff on that recipe, turning the loaf into muffins and adding a topping of roasted strawberries! Here in Northern California we are blessed with some of the greatest produce on earth – all year long. It is remarkable what we can find in the markets, even berries in these hot Indian Summer days. With the mercury still reaching into the 90s, it is hard to believe that it is October. When fruits are at the end of their season and not at their peak, you can roast them to intensify their flavors and deepen their sweetness. Beth roasted hers with a combination of pomegranate molasses and vanilla but you can use maple syrup, balsamic vinegar, or honey as well. It only took about 15 minutes to get them roasted to perfection. Then you can hold them for a day or two until you are ready to bake with them or use them in another recipe. I love make ahead options. Beth’s muffins are made from ground oats (use gluten-free oats if needed) and smashed bananas with chocolate chips all blended together into a lovely flavor combination that is a little like a banana split, and a little like chocolate covered strawberries. Pure heaven! If you can’t get strawberries, you can leave them out or pin her post for later in the year when they are back in season. She also has a ton of amazing recipes that take advantage of the fall harvest including pumpkin pancakes (heaven help me! ), squash soup shooters (always a fun way to begin a meal) and The Artist’s favorite, persimmon bread! Watch out for these muffins … one bite and you will be addicted and you’ll never want to settle for plain banana muffins again! Thank you Beth for sharing this lovely recipe with us. Happy Chocolate Monday everyone! Roasted Strawberries tucked into the batter create the perfect spot of brightness in these muffins! For the rest of the recipe, please click over to Beth's original recipe on OMG Yummy. To learn more about Beth, follow her food adventures, and discover her delicious recipes, make sure you visit OMG Yummy! and subscribe so you don’t miss any postings! While I am taking care of my husband after his stroke, some of my friends have generously offered to help me out with the blog. Thanks for understanding my sporadic posting and have fun discovering these incredibly talented food writers and recipe developers. Enjoy! « Celebrating The Art of the Pie with Kate’s Pumpkin Pie! Gosh Jane – what a truly lovely post. I feel like you brought this recipe to life in a whole new way. I have been struggling to get any writing done (yes I have a few major life events I’m dealing with too) but if you can keep on plugging, I am just going to be inspired and do the same! I love how you talked about our similarities and mostly, I just love that we all lift each other up when we need it. Sending you and the artist XOXO.